German architect André Broessel, of Rawlemon, has looked into his crystal ball and seen the future of renewable energy. 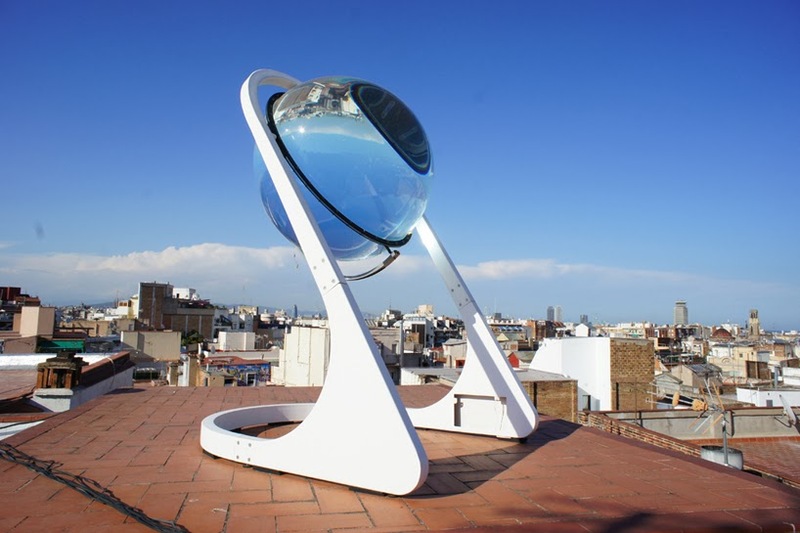 In this case it's a spherical sun-tracking solar energy-generating globe — essentially a giant glass marble on a robotic steel frame. But this marble is no toy. It concentrates both sunlight and moonlight up to 10,000 times — making its solar harvesting capabilities 35 percent more efficient than conventional dual-axis photovoltaic designs. André Broessel was a finalist in the World Technology Network Award 2013 with the globe's design and afterward produced this latest version, called Betaray, which can concentrate diffuse light such as that from a cloudy day. Let me repeat that. This is 35% more efficient than current solar panels and is able to operate on cloudy days. It concentrates light by 10,000 times. The second video has slightly better film of it, but it is in spanish. The first video is in english.